This scene inspired both the corporate and alternative media to focus attention on this once tiny anti-Wall Street rally and turn it into a full-blown worldwide march… blaming those evil, money-grubbing bankers for all of the world's problems. 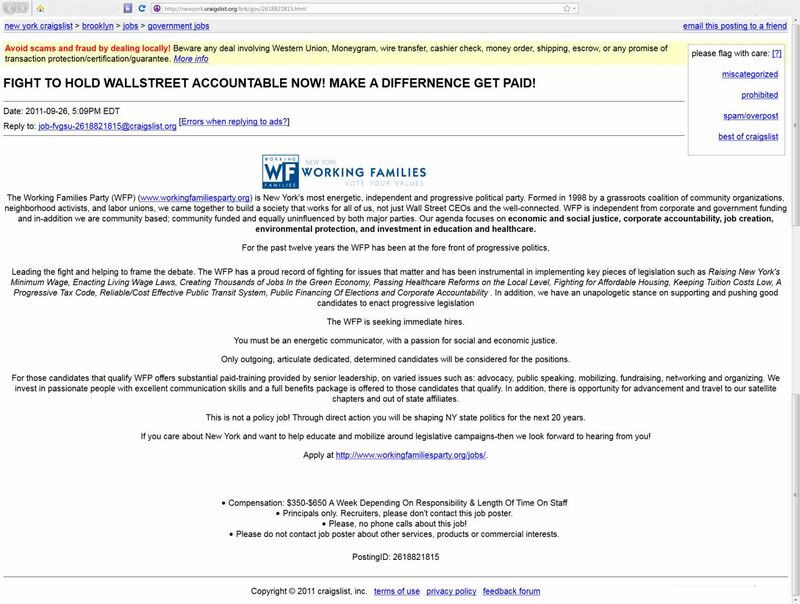 … The reality is many NGOs (Non Governmental Orgranizations) are behind the spread of these Wall Street protests… organizations such as MoveOn.org to the Alliance for Global Justice (afgj.org) to ACORN (acorn.org) were secretly funding and promoting Occupy Wall Street demonstrations from day one. Update: October 15th @ 8:34 a.m – I was just asked who is behind the website United for #globalchange… of course that's non other than the United Nations – perhaps the most evil NGO on the face of this earth. Ask yourself how in the world a two-bit, unheard of "leaderless" "movement" like Occupy WallStreet was able to get the United Nations to promote this Wall Street protest and spread it worldwide in record time. This is the same United Nations that oversees every building code on the planet… every school district on the planet… every scam charity on the planet… and every mind-wrecking vaccination given to the stupid sheep on the planet. Some say all roads lead to Rome. I say all roads lead instead to 760 United Nations Plaza in New York City. This is all happening because it's part of the agenda. It's a must be. It's the perfect example of astroturfing (a form of advocacy in support of a political, organizational, or corporate agenda, designed to give the appearance of a "grassroots" movement). This is no kumbaya, let's all get together to fight those money-grubbing greedy bankster moments. This is a carefully crafted and orchestrated psychological operation (probably planned many many years ago) to fool the masses in so many different ways. Thought you guys would be interested in my experience of the Occupy fakery. Drove by the state building twice today and there were no more than like 6 younger people out there with cardboard signs. Anyways, not telling you guys anything you're not well aware of, but like I said, this is my first personal encounter with media fakery. So what's really going on here? Why is this Wall Street protest spreading overseas so quickly? What's the agenda?